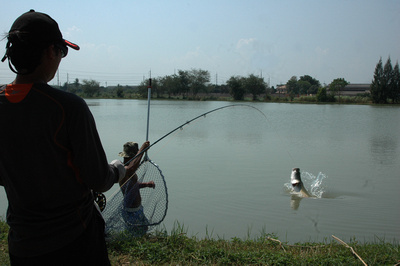 The arapaima, pirarucu, or paiche (Arapaima gigas) is a South American tropical freshwater fish. It is a living fossil and one of the largest freshwater fishes in the world. 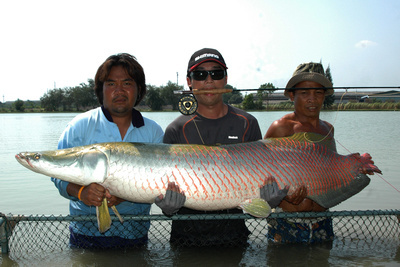 Arapaima can reach lengths of more than 2 m (6.6 ft), in some exceptional cases even more than 2.5 m (8.2 ft) and over 100 kg (220 lbs). The often cited maximum length of 4.5 m (14.8 ft) comes from a single second-hand-report from the first half of the nineteenth century, and is not confirmed. The maximum-cited weight for the species is 200 kg (440 lbs). Source from Wikipedia. 1 hour on Albright 5 wt rod.